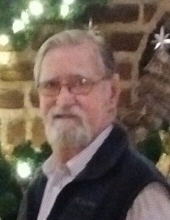 Bobby Lee “B.L.” MC Glothin, 84 of Prospect, KY died Wednesday, January 23, 2019 at Norton's Brownsboro Hospital in Louisville. He is preceded in death by his first wife, Kyla Wilder Mc Glothin, brother, Daniel Mc Glothin, and parents, Herbert L. Mc Glothin and Madella Witt Mc Glothin. Bob is survived by his wife of 36 years, Kaye Ross Mc Glothin; sons Michael Mc Glothin (Brenda) and Mark Mc Glothin (Paula); granddaughter, Chelsey Tingle (Derek); and great grandsons, Brady and Brock Tingle. He has two stepdaughters, Rhonda Moore (Dennis) and Paula Adams (Greg), numerous step grandchildren and great grandchildren. He is also survived by his brothers John Mc Glothin; Clay Mc Glothin (Evelyn); Lynn Mc Glothin (Janet); Gerald Mc Glothin (Tammy); and his sister Diane Everett (Donald). He retired from CSX at age 52. He and Kaye traveled extensively for a short time before raising and racing Thoroughbreds in FL. He had a winner at Gulfstream the day he died. Family and friends were received by Hosparus in the hospital. There will not be a funeral. His ashes will be interred at Davis Cemetery, Coalfield, TN. Please join the family for food, drink, and a celebration of Bobby's life during a Gathering of Family and Friends that will be held from 2:00p until 5:00p on Sunday, April 7, 2019 at Clark Legacy Center, 3000 Versailles Rd, Frankfort, KY.
To send flowers or a remembrance gift to the family of Bobby Lee Mc Glothin, please visit our Tribute Store. "Email Address" would like to share the life celebration of Bobby Lee Mc Glothin. Click on the "link" to go to share a favorite memory or leave a condolence message for the family.